Really not a great photo above (I almost considered not including it) because it doesn't give this dish justice on how amazing it tastes. This soup is restaurant quality. It could be on Stephan Pyles' or Dean Fearing's menu in Dallas because of its southwestern profile and great flavor and texture. Stirred in some Spicy Salsa Roja that we had from a recipe we made earlier in the week (to add yet another layer of flavor and heat) -- the salsa recipe was from Food and Wine Magazine's March 2014 issue (p. 99) -- Zucchini Quesadilla with Spicy Salsa Roja. 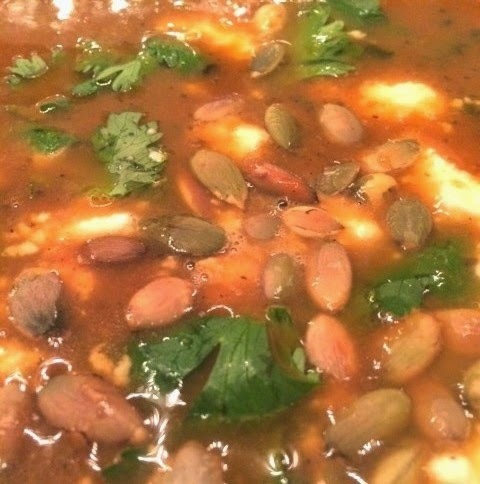 The quesadilla would actually be a nice accompaniment to this soup recipe!